After we left Kigali yesterday, we drove three hours to a campsite just outside the town of Musanze (also known as Ruhengeri) in northwestern Rwanda. 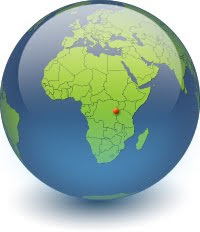 The landscape here is dominated by the Virunga Mountains, a chain of volcanoes along the borders of Rwanda, Uganda, and the Democratic Republic of the Congo. The steep rainforest slopes shared by these three countries are home to the critically endangered mountain gorillas. It was here in Rwanda's Volcanoes National Park that primatologist Dian Fossey studied the gorillas for 13 years, an endeavor which culminated in her celebrated autobiography Gorillas in the Mist . We left camp very early this morning to see the gorillas in the wild. After a briefing on how to behave around the gorillas (such as making sounds to let them know we mean no harm), we set off on our trek. We headed towards Mount Sabyinyo, an extinct volcano and the oldest peak in the Virunga Mountains. The summit of this mountain marks the spot where Rwanda, Uganda, and the Democratic Republic of the Congo meet. The Sabyinyo family of gorillas we were tracking includes the largest silverback in the world, weighing 485 pounds. We started out walking through farmland for a while until we reached a crumbling stone wall that signifies the edge of the park. Then we started hiking through dense bamboo forest on muddy trails. As we continued to ascend the mountain, the trackers who were monitoring the group would radio back to our guide to let him know which way to lead us. As we got closer to the gorillas, we had to leave the trails, following our guide and porters who would cut through the dense rainforest with machetes. The hike was not terribly difficult, but it was slow going, as we had to navigate through dense hanging vines and watch out for stinging nettles. Long pants were not enough to protect against the painful stingers of these plants, and we kept getting stung on our legs with almost every step. The stingers do not actually stick into the skin, although the toxin makes it feel that way. If you receive a sting and leave the area alone, the pain goes away in a few minutes. After two hours, our guide informed us that we were very near the gorillas. We had to leave our packs with the porters, taking only our cameras. Our guide informed us to talk only in whispers, to stay close together at all times, and to avoid pointing at the gorillas or using a camera flash, as it might seriously piss them off. It was just our luck that the gorillas had situated themselves in a dense patch of stinging nettles. Our guide had thick protective pants and kept reminding us to keep up with him, which proved easier said than done. We had to watch our every step as we trudged slowly and cautiously through the nettles along a narrow path cut by a machete. At last, we caught our first glimpse of a female gorilla. The mist hovering around the towering forest peaks gave a very atmospheric feel to the place, At one point, two juvenile gorillas ran past me, perhaps only five to ten feet away. Tourists are supposed to remain at a certain distance from the gorillas to protect them from disease, but you can't do much if they approach you instead. The gorilla is our closest living relative after the chimpanzee, and they are therefore susceptible to human diseases – in fact, you are not allowed to visit the gorillas if you have been sick in the previous three days. We saw a few more members of the group, including a baby and one of the silverbacks, before it started to rain. I had stupidly left my poncho in my backpack, which was with the porters, so I covered my camera with my clothes the best I could, but it took a while to get back to the cover of the bamboo forest. We stood in the rain for another hour before it finally began to let up. By this time, my camera was soaked, and I put it in someone else's waterproof bag for our second trip out to see the gorillas. I didn't want to risk further damage to my camera if it started to rain again (luckily, my camera ended up without permanent damage after drying it back at camp that night). We had stayed out for 20 minutes before the rain started, and time with the gorillas is limited to an hour (and eight people), as the gorillas begin to get uncomfortable with more than that. That gave us 40 more minutes before we had to begin the wet descent down the mountain. We managed to find much better views of the gorillas the second time out, seeing the large silverback and all additional members of the group. I was cold, shivering, and lamenting not having my camera on the most amazing wildlife experience I've ever had. But I managed to forget my desire to take photographs and just enjoyed the experience. It started drizzling again, and before long it was time to leave the gorillas. The descent down the mountain was almost as much fun as seeing the gorillas. The rain had made the path nightmarishly muddy, and it was quite a challenge to keep from slipping down the steep slope. The walking sticks we were given were invaluable – with every step, I plunged the stick deep into the mud on the slope in front of me, putting all my weight on it as I descended a little at a time. I then pulled the stick out and began the next step. The mud was so deep that my shoes and socks were completely submerged with most steps, and the suction of the mud almost pulled my entire shoe off on several occasions. Everyone in our group fell at least once. And remember, there were stinging nettles on both sides of the trail, so falling in the mud was very much preferable. As we neared the bottom of the mountain, we were so filthy that we didn't care how deep the mud was – it was impossible to get any dirtier. Mud was slopped on my pants all the way up to my thighs, and my shoes glistened with thick ooze. I squished with every step I took, as there was a thick layer of muck inside my shoes. The rain had also provided another surprise – earthworms slithering out of the mud were a good two feet long and as thick as small garden snakes. We finally made it back to camp, cold and dripping with mud. There was no water in the showers, so I had to just change into clothes I had worn about ten times before. Laundry has proved impossible in this rain and dampness. Clothes that I washed two days ago are wetter now than when I hung them up to dry. But it's all part of the experience, and I am absolutely in love with Africa!